Are These the Heirs to Freedom Summer’s Legacy? 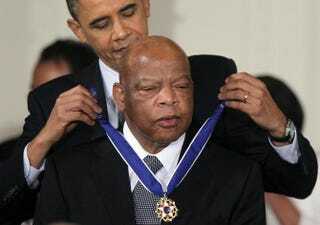 Rep. John Lewis (D-Ga.) is presented with the Medal of Freedom by President Barack Obama during an East Room event at the White House Feb. 15, 2011. In 1964 the Congress of Racial Equality and the Student Nonviolent Coordinating Committee launched the Freedom Summer campaign in an effort to increase African-American voter registration in Mississippi against fierce racist opposition. The campaign gave rise to scores of leaders who played pivotal roles in the civil rights movement. Many of them, including longtime Rep. John Lewis (D-Ga.), who was then chairman of SNCC, paved the way and set examples for modern activists and advocates for voting rights and civil rights generally. Indeed, it's been argued that many of today’s battles are similar to those fought 50 years ago, especially in the area of voting rights. So it's no surprise that these modern-day leaders, each in his or her own way, remind us of those who came half a century before them. There's no question that the White House is a simultaneously powerful and challenging place to be when you want to advocate for social justice. Much like President Lyndon Baines Johnson, who signed the Civil Rights Act in 1964, President Obama is a strong ally for today’s civil rights issues, including voting rights and marriage equality. “Because of the civil rights movement and because of the laws President Johnson signed, new doors of opportunity and education swung open for everybody. Not all at once, but they swung open,” Obama said in April on the 50th anniversary of the Civil Rights Act. In the tradition of one of his predecessors, Robert F. Kennedy, who equated voting rights with racial justice and helped create the landmark Civil Rights Act of 1964, Holder is a strong force within the Obama adminstration for civil rights. He's been lauded for his efforts in the area of voting rights (including for convicted felons) and in other areas that weren't hallmarks of Freedom Summer but would certainly make his civil rights forefathers proud—like his effort to reduce the mass incarceration of African Americans. In 1964 Lewis (today the Democratic U.S. representative serving Georgia’s 5th Congressional District) served as chairman of SNCC. “As chairman of SNCC, I worked with organizers from a federated council of civil rights organizations,” he said in a recent statement. “I traveled all around the country talking to students asking them to participate in Freedom Summer, and they came from everywhere. They had witnessed and admired the struggle for human dignity waged all across the South through sit-ins and nonviolent protests.” No modern counterpart necessary here: As a member of Congress and dogged voting rights advocate, he's still working as hard as ever. Much like SNCC, which played an important role during Freedom Summer, the Dream Defenders are working to bring about social change by training and organizing youth and students in nonviolent civil disobedience, civic engagement and direct action. These young modern activists are taking action to create real change in their communities in ways that are reminiscent of those who preceeded them 50 years ago. Like Stokely Charmichael, a SNCC staffer who would eventually replace Lewis as chairman of that group, Jealous, the former NAACP president and CEO (now a senior fellow at the Center for American Progress), has taken up the modern-day civil rights battle against voter disenfranchisement. He also helped usher the NAACP, one of the oldest civil rights organizations, into the digital age. Last summer’s acquittal of George Zimmerman in the death of 17-year-old African-American Florida teen Trayvon Martin sparked civil rights protests across the globe. His shooting highlighted the perils of racial, ethnic and gender profiling in America. In fact, the moral outrage it sparked was not unlike what we saw nearly 50 years ago in the aftermath of the brutal murders of Michael “Mickey” Schwerner, a 24-year-old full-time activist for CORE; James Chaney, a 21-year-old, local Mississippi CORE activist; and Andrew Goodman, a 20-year-old Freedom Summer volunteer. The deaths of the men, who were killed by members of the Ku Klux Klan and law-enforcement officers while working on the Freedom Summer campaign to register black voters, helped galvanize a movement. Ella Baker is just one example of someone who played an important role in the organizations most critical to Freedom Summer's work but who wasn't widely honored for her contributions at the time. Just as Baker toiled for the NAACP, Martin Luther King Jr.’s Southern Christian Leadership Conference and SNCC, surely plenty of unsung heroes are currently fighting for voting and other civil rights in relative obscurity. Lynette Holloway is a contributing editor at The Root. The Chicago-based writer is a former New York Times reporter and associate editor for Ebony magazine.